The thing is with all of this stuff is, it's JDM. JDM usually = expensive. I know the mudguards are in the $200 area and the Rumion vent visors are up in the $300's. But, the rear garnish is here. But that's not the full on Modelista one, just the top part. Still a good looking piece. And I'm pretty sure the side skirts are full on Rumion sideskirts. Albeit with a large price tag, like the front and rear clips. 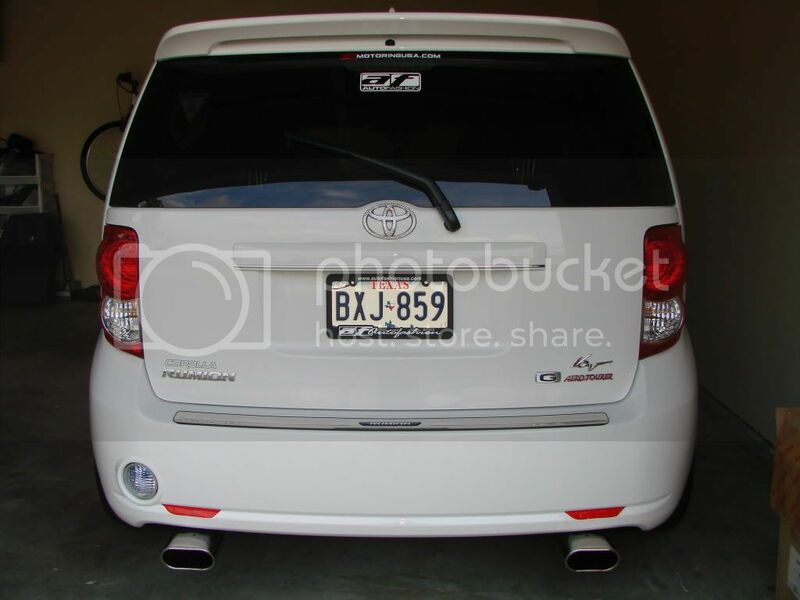 just wanted to update the site a bit.. if you havent seen pictures of my xb's rear.. it has the full modellista chrome...thing.. and it also has the rumion badge conversion..
Can't wait to see the whole thing. Oh and I send you a PM. I really love that chrome garnish!! How much did it cost? JW its a little to much for the style Im going for. check out one of my friend is finished with his FIRST U.S CONVERTION TO RUMION..But he is still missing some parts..
his xB, er Rumion is lookin good!! i like the rear spoiler - that is on my short list of mods! and those rear taillights are pretty nice too! Yeah he is missing the rear bumper. Nice mock up but thats not the same. What did your friend do with his headlights? I need a pair of xB factory headlights. cHECK OUT THE PRICE OF THE KIT THAT THEY HAVE IN JP..
164,850yen = $1502.05 US Dollars. Not bad. But shipping, importing, exporting, etc... You'd probably end up paying upwards of $3000 for a $1500 kit.